In their recent run of friendlies, Ange Postecoglou’s Socceroos mixed the good with the bad. They played well against England during a visit to Sunderland, but lost 2-1. They then returned to Australia for two matches against Greece, and although they dominated the first game to claim a 1-0 win, albeit through a late strike from substitute Matthew Leckie, they played poorly in the next match to lose 2-1. On paper, the results were far from impressive. But in contrast to their mixed fortunes from a purely outcome-based perspective, there is little doubt that Postecoglou has a clear understanding of what he wants from his players. In fact, some might argue that his footballing philosophy has never been more obvious. Even against high-profile opposition like England, the former Brisbane Roar coach wants Australia to play proactively. He wants them to play out from the back, possess the ball and, on the occasions when they lose it, press with intensity to get it back. In short, he aims to create a system that allows his team to take charge and, to go along with that, a group of players who can work effectively within that system. 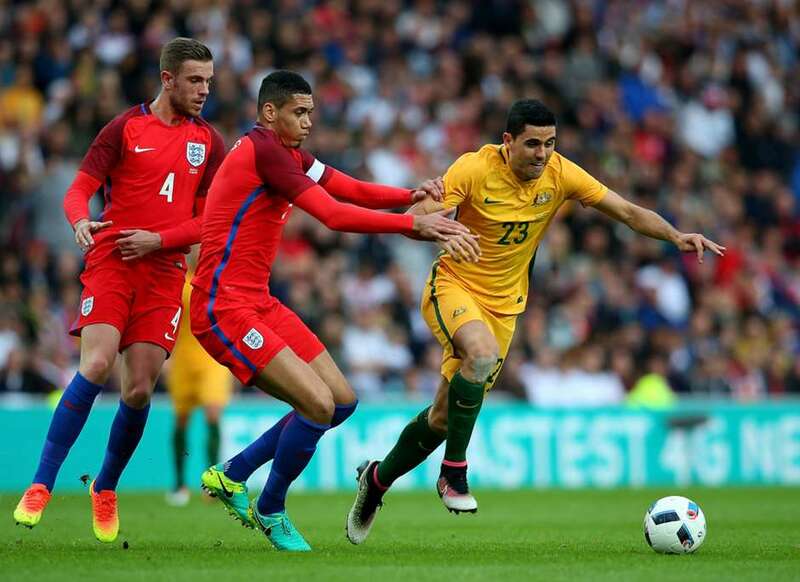 The Socceroos showcased this proactive approach against England. Playing within the structure of a 4-4-2 diamond formation, they set out to dominate. In attack, this took on the form of a slick possession game. Tom Rogic operated at the tip of the diamond, trying to weave his way around England holding man Jack Wilshere, while Aaron Mooy and Massimo Luongo took up the two central midfield roles behind him. Mile Jedinak completed the diamond, playing in the deepest position, and these four players were a key reason for Australia’s eventual dominance of possession (53.4% to England’s 46.6%). In order to truly generate openings in attack, though, the Socceroos needed some width from their fullbacks. On this particular occasion, Liverpool’s Brad Smith played at left-back and Perth Glory’s Joshua Risdon played on the right side of defence, and between them, they offered almost all of the width in Australia’s formation. The likes of Mooy and Rogic used them pretty well, too, initially playing through the centre of the pitch, thereby forcing England’s defensive structure to narrow, before swinging the ball wide to the onrushing fullbacks. This created a couple of options for Australia. They could either cross straight away, something Australia did on a very high 29 occasions for the game, or they could try and work an opening via the channels. In relation to the latter, the Socceroos could do this due to England’s 4-4-2 diamond. Indeed when Risdon found himself in possession down the right, England’s left-back, Ryan Bertrand, would have to come out to meet him given the absence of any wingers in Roy Hodgson’s formation. This meant there was now space in behind Bertrand, and Australian striker Robbie Kruse often looked to exploit this by darting into that right-sided channel. So with this kind of focus on creating options out wide, it probably came as no surprise that Australia’s only goal for the game would eventually come from a cross. Milos Degenek, on as a substitute for Risdon at right-back, swung in a swerving cross from the flank, and although there was no Socceroo on hand to turn the ball in, England defender Eric Dier scored an own goal, after an unconvincing diving header, to complete the attack. As well as that, Australia pressed high up the pitch on the defensive end, and they often won the ball back with a fair bit of speed. They used their centrally-located attackers, and the four players in the diamond behind them, to rush England into quick decisions. In certain moments, such as in the sixth minute, when Kruse shot wide following a quick transition, the Socceroos created turnovers that led directly to shooting opportunities. In other moments, their pressing simply forced rushed clearances from the opposition, something which allowed Postecoglou’s players to regain possession and get on with working the ball towards goal. Much of the above sounds pretty good, yet for all of these positives there were also negatives. Australia’s high defensive line, especially in combination with the advanced positioning of fullbacks Smith and Risdon, meant that England could launch quickfire counter-attacks at a moment’s notice. Australia tried to prevent them from doing so by pressing, but when the technically gifted Wilshere could set England on their way by playing around that pressure, the Three Lions could find themselves through on goal within the space of two sharp passes. Between minutes 11 and 15, for instance, Wilshere twice beat the initial line of Socceroos pressure with a deft pass to a nearby teammate. The first time around, he quickly played a ball into the feet of Jordan Henderson, who fired a long diagonal in behind the Australian defence for Marcus Rashford. The move eventually broke down after crossing opportunity, but a couple of minutes later, Wilshere would provide the young forward with another chance to make something happen. The Arsenal man accelerated from a deep position in midfield to begin with, around 15 minutes in, before sliding a ball into the path of Raheem Sterling. The Manchester City player followed up with a direct ball to put Rashford through on goal, but a poor first touch halted the momentum of the attack. Even so, it only felt like a matter of time before England would create something more substantial on the counter, and that moment arrived just after half-time, as Australia lost possession in the final third. Postecoglou’s men, in typical fashion, tried to retrieve possession with aggression, but once the contested ball fell to Henderson, they were left desperately shorthanded at the back. The energetic midfielder slashed a pass forward to the left flank, where Sterling found himself in behind Risdon. A quick sprint up the touchline meant that it was now two-on-two as Sterling approached the final third, and the pacey attacker took advantage of Australia’s unset defence soon after. He played a square pass to find Wayne Rooney on the edge of the area, and one thunderous shot later, England had found the back of the net. Australia’s desire to push forward had cost them, and if there was one thing that needed to be addressed following the England fixture, it was the fact that they lacked a bit of balance between attack and defence. For the most part, though, the performance was a positive one, and the Socceroos carried their form into their first match against Greece. Interestingly, their approach remained almost identical despite a shift in formation. Postecoglou moved to a 4-3-3, but with wingers Kruse and Nathan Burns drifting in off the wings to take their places in between the lines, the width was again provided primarily by the fullbacks. And from this foundation, Australia produced something pretty close to an exceptional matchday display. They enjoyed 61% of possession, created 17 opportunities to shoot and, continuing the cross-heavy theme, hit 26 crosses into the area. Granted they struggled in front of goal, only hitting the target with three of their shots and having to wait until second-half stoppage time to hit the lead, but Postecoglou’s foundation was clearly in place. Perhaps unsurprisingly, the goal came about after a quick shift of possession to the left-hand side and a decent pass back infield from young left-back Alex Gersbach (who came on as a late substitute). Leckie did the rest, swivelling onto his right foot before burying the ball in the back of the net, and, in doing so, he added the finishing touches to a strong outing at Sydney’s ANZ Stadium. Australia then travelled to Melbourne for Game 2 against Greece, but their good form seemed to desert them somewhere along the way to Etihad Stadium. They were far less assertive in possession, moved the ball too slowly and struggled to work their way through the opposition’s defensive structure. 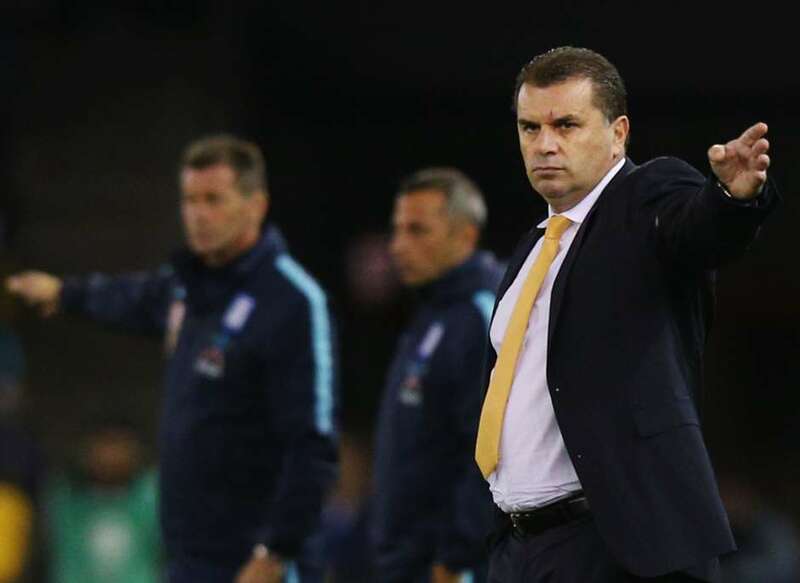 In the post-match, Postecoglou would, in part, put this down to fatigue, but perhaps a renewed approach from the Greeks caught the Australians off-guard to some degree. Whereas Michael Skibbe's Greece sat off against Australia in the first of the two fixtures, he instructed his players to be much more aggressive for the second encounter. He asked them to press a lot higher up the pitch, a tactic aimed at disrupting Australia’s possession game. It worked extremely well, too, and after dominating the opening exchanges, their moment arrived on eight minutes. Here, the Socceroos tried to play out from the back. They quickly found themselves hemmed in by Greece’s 4-4-2 defensive structure, however, and when the ball arrived at Mark Milligan’s feet, he took a little too long to steady himself. Burly Greek striker Apostolos Vellios seized upon the opportunity, sliding in to dispossess Milligan. Benfica’s Andreas Samaris soon picked up the loose ball, and with a simple through ball towards the right-sided Petros Mantalos, he dismantled the unset Australian defence in a single motion. Mantalos quickly netted the opener with a stunning finish, and this early attack summed up Australia struggles for the match. They didn’t deal with a Greece team who were determined to press, to harry and to make life difficult for them, and because of that, they only achieved three shots on target in a game they would go on to lose 2-1. On the pitch, this translates into a high-octane pressing game, possession football and a huge emphasis on his onrushing fullbacks. It’s attractive and entertaining, but equally, it’s also risky. Australia leave themselves exposed in order to try and impose themselves upon the opposition, and as it stands, there’s still plenty to tinker with before they resume their World Cup qualifying campaign against Iraq at the start of September. That’s probably a fair assessment, too. The Socceroos may have mixed the good with the bad against England and Greece, but with a clear gameplan in mind, the foundations have been successfully laid. Australia must now aim to build upon those foundations, and if they can do so, they’ll be a lot closer to achieving Postecoglou’s ideal in terms of performance, strategy and outcome.